Posted on Wed, May 16, 2012 : 4:44 p.m.
Canham Natatorium is one of the University of Michigan's venues that athletic director Dave Brandon would like to renovate. CHICAGO -- The University of Michigan spent nearly $500 million dollars to update its football, basketball and hockey facilities in recent years. Now, it will turn its focus to non-revenue sports. Michigan athletic director Dave Brandon said Wednesday a master plan has been drafted that calls for $250 million in renovations to nearly every athletic facility on campus in the next seven to 10 years. Brandon said the end game is to make Michigan eligible to host postseason games and tournaments in every sport. "We’ve really taken our entire campus footprint and said, ‘What do we need to do to get all of our facilities lifted to a point where we really feel we would be competitive with any other campus location for a national tournament,’' said Brandon, in Chicago for the Big Ten's annual spring meetings. "So, our standard would be to have facilities in every sport that would make us eligible as a site for regional or national competition." Brandon said some of Michigan's facilities are "just not adequate," and named Canham Natatorium as an example. 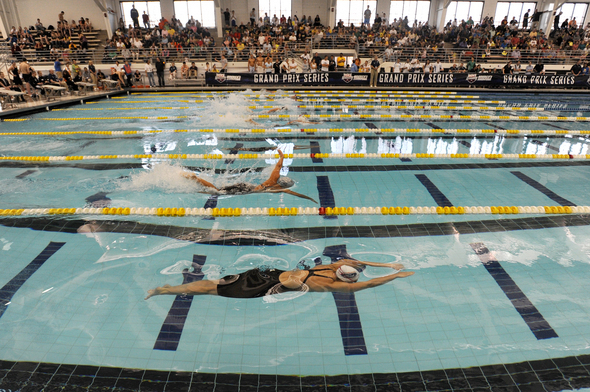 Michigan added women's water polo as a varsity sport in 2005, but never upgraded or expanded the facility. Now, it's out of date, Brandon said. "We added water polo and never added any more deck space, any more locker rooms, or any more pool capacity, and so we’re constrained," he continued. "We need another pool. We need more capacity. We need more locker room space. "That’s just an example of one of the things we need to do. We couldn’t host a national competition." Brandon said the master plan also calls for building a lacrosse facility. Michigan added men's lacrosse this year, and the women begin play in 2014. He said the university is constrained in its growth near its main athletic campus because of land issues, but there is room to expand to the south. "That’s part of the tricky nature of this," he said. Michigan's most recent expansion included its revenue sports. Nearly $300 million was spent on football, $100 million on basketball and $20 million on hockey. Tue, Sep 11, 2012 : 10:31 p.m.
You have a link to plans or renderings of anything? Tue, Sep 11, 2012 : 10:38 p.m.
Thu, May 17, 2012 : 4:08 p.m.
Is there an estimate for the number of jobs created? Will people that think government does not create jobs refuse to accept the wages produced on these sites in their businesses? Will congress pass a law demanding all contracts let on these jobs be re-negotiated 1/2 way through to save taxpayers money? Thu, May 17, 2012 : 2:46 p.m. This is great news on a couple of fronts: First, it demonstrates an excellent long-term vision for Michigan athletics, and a commitment to ALL student athletes, not just a focus on the money sports of football and basketball. Education is not just in the classroom. Participation in extra-cirriculars such as sports is an invaluable educational experience that teaches teamwork, collaboration, strategy, leadership, winning with humility, and learning from setbacks. This project will further enhance UM's reputation as a world class institution, and help create future leaders. I would encourage anyone to take in any of the &quot;non-money&quot; sports like gymnastics, wrestling, water polo, etc, and not be impressed by these student athletes, and their dedication to excellence. They are our future. Second, the creation of vevnues to attract NCAA tournament competition, only helps Ann Arbor tourism further in the way of more visitors coming to town, and spending money while here: hotel occupancy, restaraunts, car rentals, etc. How can this be a bad thing? Congratulations to UM athletics, and Go Blue! Thu, May 17, 2012 : 2:34 p.m. Despite some of the anti-college sports commentary on this article, the fact is that to the vast majority of Michigan students, potential students, and alumni, sports ARE very important. They add a lot to the college experience (IMO) while offering great opportunities to student athletes. Improving the facilties is certainly very important to all the student-athletes working very hard in these non-revenue sports. There's nothing wrong with improving and updating facilities that are out of date or inadequate. Since the athletic department is paying for them, that does not provide any drain on U-M overall. Thu, May 17, 2012 : 12:51 p.m. Three-quarters of a billion dollars wasted. Universities are about learning, not about sports. When will the bozos in charge focus their financial priorities where they are needed? Thu, May 17, 2012 : 12:01 p.m. The athletic department is not financially independent as long as they borrow under the University's bonding authority. The University can only borrow so much before it's bond rating is reduced and then EVERYONE at the University has to pay more interest. So when the decision is made to borrow money to build a replica of the roman coliseum, the decision is made NOT to borrow money to build something else, like a new hospital, academic center or recreational sport facilities, high speed rail connecting North and Central campus, etc.. The athletic department is a huge drag on the University's bond rating as long as their debt is lumped in with ours. Everytime someone who is otherwise not academically competitive is admitted to the University at their behest, it is a drag on the quality of education for those around them. NO MORE BONDS FOR THE ATHLETIC DEPARTMENT! If they want to brag about how they are financially independent, make them pay off every cent they have borrowed under the University bonding authority RIGHT AWAY and before they borrow one more cent to build non-revenue facilities that should be much farther down the University's priorities. Thu, May 17, 2012 : 12:09 p.m. I could not agree more! If they want to brag about their autonomy then go get a loan WITHOUT the University behind you! Thu, May 17, 2012 : 11:33 a.m. The early posts so far are missing the mark; this is an Athletic Department resposibilty. The monies come from the revenues generated as well as donors, say like Al Glick type folks. The promise of a new Track and Field facilitiy has been in works for 5 to 7 years and remains in limbo. Lots of ideas, so plans are made but nothing is getting off the ground. Let the upgrade of non revenue facilities continue. I like the new face of the Athletic Campus. Thu, May 17, 2012 : 3:01 a.m.
Maybe AnnArbor.com needs to draft an article about how the Athletic Department gets its funding, because clearly many people have just assumed it's mostly through university general fund dollars and thus tax dollars, and that is completely false. A whopping .2% of the athletic department's 2011 revenues came from School funds (i.e. general funds). The vast majority (99.8%) came from rights/licensing, ticket sales, contributions, and other revenue. So the notion that somehow this money is being mismanaged to support frivolous athletic spending is absurd and ignorant. This is the athletic department spending money they independently make from the university to further the cause of the athletic department. It's no different than a private business spending money they independently make to expand their business. If you really want the athletic department to stop spending money and instead the University to lower tuition or the government to boost education spending, I suggest you cancel your season tickets and allocate any money you intended to spend on Michigan apparel, and donate it to the University and cut a check and mail it to Lansing. Thu, May 17, 2012 : 6:22 p.m.
Mr. Bodnar- Perhaps the University should spin off this &quot;independent entity&quot; and let it run on its own? This new entity can be called the &quot;Ann Arbor Premier Collegiate-Level Athletics Association.&quot; Perhaps something else, but it should most certainly eliminate &quot;The University of Michigan&quot; from its name. It is from the core mission of the University of Michigan, and its excellent reputation, that the Athletic department draws its strength. I'm sure you have no doubt that, once separated from the boring-old-curmudgeonly University of Michigan, this new independent entity will have no problem attracting top athletes, securing licensing/rights revenue streams, and donors willing to fund an athletic program that's totally unrelated to the University. HERE'S AN IDEA: How about we (the University of Michigan) all act like a &quot;team&quot; (I know, foreign concept in athletics) and play a &quot;team game?&quot; That might involve a strong financial entity, such as the AD, kicking back money to the academic program, so that the majority of students who are here to do what they're supposed to be doing (learning) can do so without having dive so deep into debt as to give up 25 years of future income. Thu, May 17, 2012 : 12:12 p.m.
How it is &quot;ours&quot; if the athletic departments doesn't use any tax payer money? It runs financially independent and from the University. Seems like nothing but upside for us as taxpayers supporting the school. The athletic department provides a huge benefit in terms of visibility and marketing to the school at absolutely no cost to us. We should say &quot;Thanks&quot; instead of ripping every spending decision they make. Thu, May 17, 2012 : 11:36 a.m.
&quot;It's no different than a private business spending money they independently make to expand their business.&quot; And therein lies the problem! It IS different! As Craig has pointed out. Thu, May 17, 2012 : 11:35 a.m. I don't get it but I like the lower tution part. Thu, May 17, 2012 : 10:46 a.m.
&quot;It's no different than a private business ...&quot; except....that it isn't a private business. Its owned by the people despite the source's of revenue. We own the place, we vote for the regents who run the place on our behalf. David Brandon and Brady Hoke are employed upon approval of the board of regents. When alumni or ABC sports cuts the athletic Department a check its our athletic department. Don't lose sight of that fact. Thu, May 17, 2012 : 3:45 a.m.
Maybe they don't need to bother now. Thu, May 17, 2012 : 2:19 a.m.
Thu, May 17, 2012 : 1:19 a.m. So THAT's why it cost me $60K to get my social work degree. Thu, May 17, 2012 : 2:57 a.m.
No that is the Republican cut taxes at all costs to make government smaller mentality that makes tuition so high. There is a direct correlation to the states cuts in education to tuition increases by its universities. Thu, May 17, 2012 : 2:32 a.m.
Thu, May 17, 2012 : 2:26 a.m. Athletics is self-supporting. No tuition money, just tickets, TV money, apparel licensing, etc. Thu, May 17, 2012 : 12:19 a.m. So now the ticket prices of &quot;non revenue&quot; sports will soar. Wed, May 16, 2012 : 11:55 p.m. Yes! The city of Ann Arbor is melting down around the UofM and they (the UofM) will waste money on sports. Our society has it's priorities totally wrong. Wed, May 16, 2012 : 11:31 p.m.
what a dumb idea to spend all that money on non-revenue sports. they should put the 250 million dollars into a reserve fund to help mitigate the damage to the University from the concussion/closed head injury lawsuits that are coming right after the legal system squeezes the NFL for all they can get. give free football tickets to students who pay too much tuition. redecorate the athletic directors office again. invest in intramural sports that a great number of potential beneficiaries. non-revenue sports are non for a reason. when I think about investing, I think about growth. all investing in non-revenue sports does is grow cost without growing benefit. Wed, May 16, 2012 : 10:34 p.m.
...and in other news, school districts in Washtenaw county continue to cut programs due to lack of funding..
Thu, May 17, 2012 : 10:31 a.m. While it is true the athletic department is &quot;self sustaining&quot; Dutchy 734 does have point. Ellis is incorrect to say the entities are not related. They absolutely are related. They are both publicly owned by the people. There seems to be a popular misconception that just because the athletic department is self funded that its somehow a privately owned autonomous organization. I fully realize each entity has its own &quot;bucket&quot; and the funds are not interchangeable. But that doesn't change the core fact that we all collectively own the university and the public school system. Thu, May 17, 2012 : 2:51 a.m. The State of Michigan gives tax breaks to business and cuts education to the bone. Thu, May 17, 2012 : 12:34 a.m. The entities are not related and there are no tax dollars funding these projects. Wed, May 16, 2012 : 11:15 p.m.
which has absolutely nothing to do with the University's athletic budget.